^ Haslip 1972, p. 6. ^ Hyde 1946, p. 4. ^ Corti 1929, p. 41. ^ Haslip 1972, pp. 6–7. ^ Hyde 1946, p. 5. ^ Palmer 1994, pp. 3, 5. ^ a b c Palmer 1994, p. 3. ^ O'Connor 1971, p. 29. ^ Haslip 1972, p. 7. ^ a b Ridley 2001, p. 44. ^ Hyde 1946, pp. 6–7. ^ a b Hyde 1946, p. 7. ^ Hall 1868, p. 17. ^ Haslip 1972, p. 11. ^ Haslip 1972, pp. 14–15. ^ Haslip 1972, p. 17. ^ Haslip 1972, p. 29. ^ a b Hyde 1946, p. 13. ^ Haslip 1972, p. 31. ^ Haslip 1972, p. 34. ^ Hyde 1946, p. 14. ^ Rolle, Andrew F., The Lost Cause: The Confederate Exodus to Mexico, University of Oklahoma Press, 1992, ISBN 978-0-8061-1961-8. ^ "Charlotte of Mexico's Misfortune", New York Times, March 6, 1885. ^ "Belgium Mourns for Dead Empress; Tragedy of Life of Charlotte, Wife of Maximilian, Is Recalled", New York Times, January 19, 1927. ^ Giving executer(s) a portion of gold/silver is well-established among European aristocracy since medieval time and not an act of desperation. 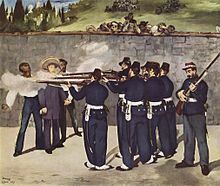 In other accounts, Maximilian calmly said, "aim well", to the firing squad and met his death with dignity. ^ Haslip 1972, p. 4. ^ O'Connor 1971, p. 31. ^ a b Ridley 2001, p. 45. イカロスの失墜 悲劇のメキシコ皇帝マクシミリアン一世伝 菊池良生 新人物往来社, 1994.9.